The material encompasses a wide range of musical styles, although the opening ‘Let’s Call a Heart a Heart’ is an easy going, swinging blues. In contrast, ‘Looking Back’ a reflection on a rural childhood, has a more pastoral & classical feel with lilting phrases from violin and saxophone. Abbey Lincoln’s ‘Throw It Away’ is outstanding; Krebs’ passionate vocal is reflected in dramatic Eastern influenced instrumentation with exquisite violin from Paul Cartwright, and great support from Scott Breadman on percussion. Other highlights include ‘So Many Stars’ featuring Rob Lockart on free flowing soprano sax, and ‘Falling Grace’, where the lyric is elaborated by an atmospheric soundscape, inspired by a winter snow storm (presumably not in California). 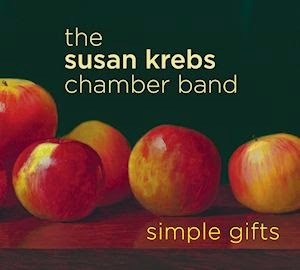 Susan Krebs’ acting background is evident in her expressive delivery, which can be a little mannered. However, there is great cohesion and musical sympathy shared by the ensemble throughout the project. Available March 15 - see YouTube Promo.